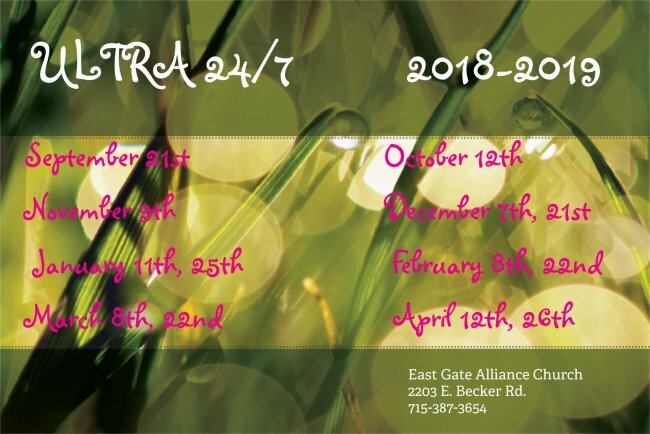 Ultra 24/7 is a community-wide outreach ministry that is geared for all youth 6th – 12th grades. Ultra focuses on the importance of God in our lives and the need to walk with Him everyday. The leaders of Ultra desire to offer a safe environment where students can hang out on a Friday night. We also offer regular crazy games, random themed events, and free food at the Ultra Cafe. If you have any questions about Ultra, please contact Pastor Aaron at 715-387-3654. Thanks!